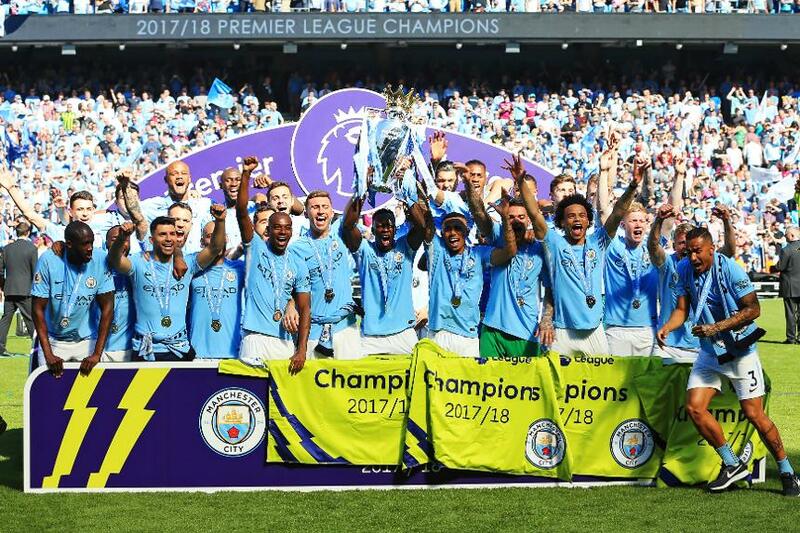 Records tumbled as Manchester City won their third Premier League title. Masterminded by Pep Guardiola, City became the first Premier League side to win 100 points in a season. They finished 19 points clear of Manchester United, scored 106 goals, had a goal difference of +79 and recorded 32 wins, all Premier League records. The season started in style. Olivier Giroud’s late goal clinched a 4-3 win for Arsenal against Leicester City as a top-flight campaign began with a Friday night match for the first time. Less than 24 hours later, Mohamed Salah struck on his debut as Liverpool drew 3-3 at Watford. For the second season running the defending champions lost their opening match. Chelsea’s 3-2 home defeat by Burnley was a shock but was an early marker for the progress the Clarets were to make under Sean Dyche. Summer recruit Romelu Lukaku scored on his Man Utd debut as they beat West Ham United 4-0 to top the Matchweek 1 table ahead of promoted Huddersfield Town, who won 3-0 at Crystal Palace. City opened the campaign with a 2-0 win at PL debutants Brighton & Hove Albion but were denied three points in Matchweek 2 by Wayne Rooney’s 200th goal in the competition. Rooney earned Everton a 1-1 draw in his second match since his return to the club after 13 years at Man Utd. But Guardiola’s side, boosted by the summer arrivals of Ederson, Kyle Walker, Benjamin Mendy, Danilo and Bernardo Silva, went on a PL-record streak of 18 consecutive victories. It started with a stoppage-time winner at AFC Bournemouth from Raheem Sterling and included victories at Man Utd and at Chelsea, as well as a 5-0 home triumph over Liverpool. That streak ended on the final day of 2017 at Crystal Palace. Roy Hodgson had been brought in to revive a team who started the season with seven successive defeats without scoring. Hodgson oversaw a 2-1 home win over Chelsea and the Eagles had a chance to end City’s unbeaten start, but Ederson saved Luka Milivojevic’s stoppage-time penalty to earn a 0-0 draw at Selhurst Park. Chelsea were Man City’s nearest challengers at the start of 2018, but lost ground after defeats by AFC Bournemouth and Watford. Harry Kane’s successive hat-tricks in December ignited Spurs’ top-four charge and moved the forward narrowly ahead of Salah in the race for the Golden Boot race at the turn of the year. Man City’s hopes of emulating Arsenal’s 2004 "Invincibles" were ended when Liverpool won 4-3 in an electric contest at Anfield on 14 January. City only dropped two points from their next eight matches, meaning a Manchester derby win at the Etihad Stadium on 7 April would hand them the title. But United fought back from 2-0 down at half-time to win 3-2 and delay their city rivals' title celebrations. But that wait lasted a mere eight days as United then lost 1-0 to bottom club West Bromwich Albion under caretaker manager Darren Moore. After lifting the PL Trophy on 6 May, Gabriel Jesus scored a stoppage-time winner on the final day at Southampton to give Man City a century of points in dramatic style. With the title in City’s hands well before the season’s end, attention turned to the top-four race and the battle against relegation. Home wins over Chelsea and Liverpool in the run-in helped Man Utd finish second, their highest placing since topping the table in 2012/13. Spurs finished third, largely thanks to a 14-match unbeaten run from late December to mid-April, which included their first Premier League win over Chelsea at Stamford Bridge. Kane scored 30 goals in a PL season for the first time, as he also surpassed a century of goals in 2017/18. But his impressive tally was beaten by one man. 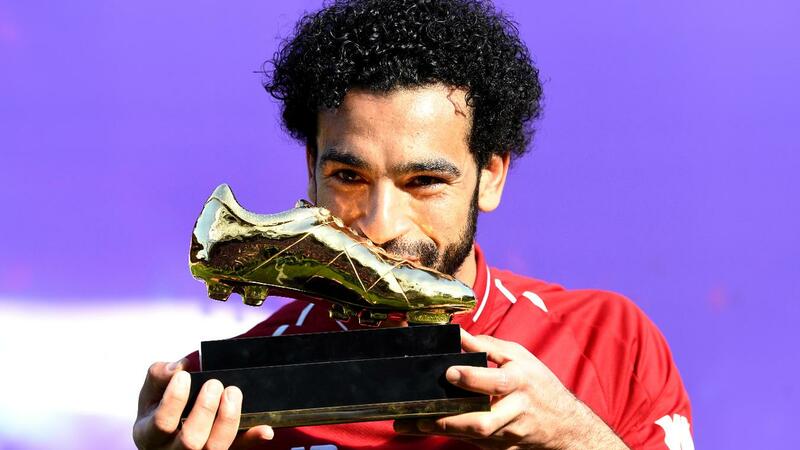 Salah scored 32 times as he set a record for the most goals in a 38-match campaign, surpassing the mark of 31 by Alan Shearer, Cristiano Ronaldo and Luis Suarez. His 32nd helped Liverpool secure fourth with a final-day win over Brighton. They held off the challenge of Chelsea, in fifth, who lost to Newcastle United 3-0 on the final day. In sixth were Arsenal, who said farewell to Arsene Wenger after 22 years as manager. The Gunners also reached the semi-finals of the UEFA Europa League, a competition Burnley qualified for by earning seventh place. Sean Dyche’s men racked up a club-record 54 points to secure their first European campaign for more than 50 years. Brighton’s home win over Man Utd on 4 May, Newcastle’s 10th-place finish and Huddersfield’s late-season draws at Man City and Chelsea ensured all three promoted sides would stay up for only the second time in PL history. 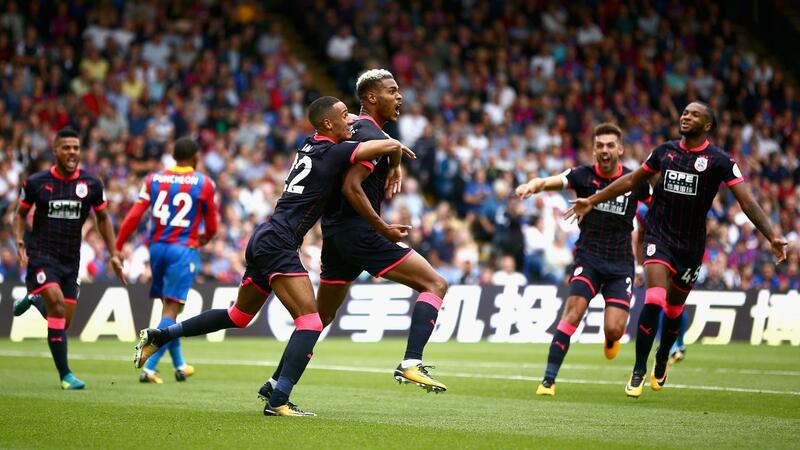 Palace, resurgent under Hodgson, won 2-1 at Stoke City as they stayed up and sent down the Potters. West Ham steered clear of the drop after David Moyes was brought in, while West Brom, who had been 10 points adrift of safety at the end of March, won 1-0 against Spurs to keep their hopes alive going into the final week of the season. The remaining relegation places hinged on Southampton, who had four points from their previous two matches under Mark Hughes, travelling to Swansea City in the penultimate round of the season. Manolo Gabbiadini was the hero as Saints won 1-0 to relegate West Brom and all but secure their safety, which was confirmed on the final day when Swansea went down by losing to Stoke.